Celtic Cardboard went to its first ever UK Games Expo. And not only did we go, we had a stand! Robin, Jen and Ethan were all there selling their games, and we asked them, what was it like as a retailer to be there for the first time? Let’s turn it over to them. For me, UKGE was the exciting premiere of my latest game, Movable Type: Second Edition, which had only arrived from the manufacturer three days before. I had frantically packed and shipped ~500 backer copies of the game and then loaded up the car for UKGE with a load more boxes. Ethan and John were driving all our products over to Birmingham on the Thursday morning, while the rest of the team flew over from Dublin. One of the benefits of Celtic Cardboard is that we can share the logistical burden of events like this – so we shared a stand, set it up together, and covered for one another so we could take breaks and explore the expo a little. Without the Celtic Cardboard team, it’s very unlikely I would have gone to UKGE – it just wouldn’t have been worth the mental stress and financial expense. A ran across a few people running stands alone and it seemed like a nightmare! The actual event was tremendous fun. Thursday evening was the press event, where many of the publishers put their games in the open gaming area and spoke to members of the press. It was an eye-opener that there were a lot more publishers than press. I had expected the reverse. This highlights just how much competition there is now in boardgame publishing and that you need to have a standout game to do well. Anyway, when I wasn’t pitching to the press, I got to meet a lot of other nice designers and publishers around me. The public days of UKGE involved standing at our booth and pitching games to everybody who came up. I found that the best approach was to give a general “We are an Irish game-making co-op,” a one-line pitch for each of the three games we had – Movable Type, Dare to Dream and Rampunctious – and then see which one that individual wanted to know more about. Some people wanted to know about all the games, while others were clearly attracted by a specific game, and in that case launching into a speech about Movable Type was just wasting time. We found that there were always people to talk to – with usually no more than a minute before another group came to the table. This was helped a lot by Paddy and John, who were standing in front of the booth giving away our free-postcard game and giving a short pitch to passers-by. Both of them did so much for us that weekend – turning their charm up to 11 and putting a positive and friendly face to the brand. Thanks, guys! In retrospect, I wish we had paid to have more space on our booth so that members of the public could sit down and play some games with us. It seemed that all we were doing much of the time was pitching and pitching and pitching, which isn’t really the best way to get a feel for a game and to decide if it’s right for you. After three days of this, my throat was ragged from all the talking, my thighs were burning from all the standing and the sales… were ok. More important than the sales though, I met some really interesting people – designers, publishers, distributors, etc. 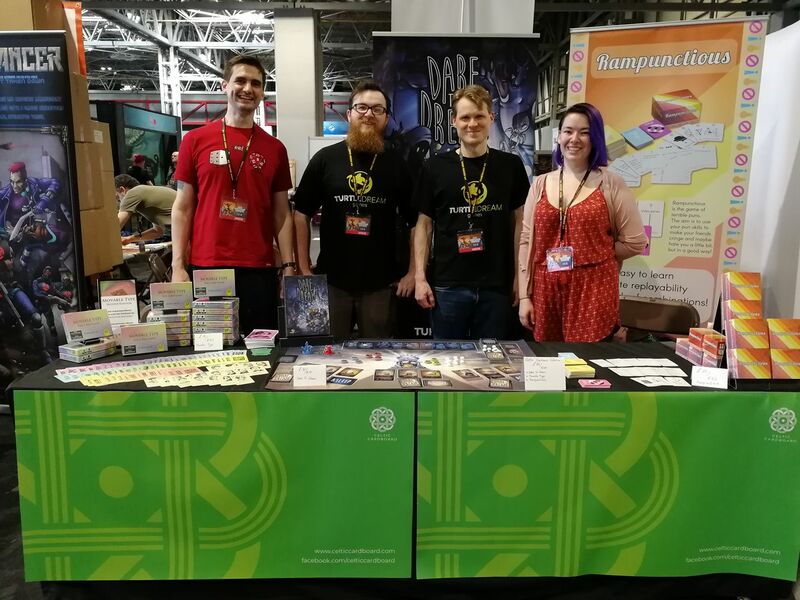 – some of whom were really enthusiastic about Movable Type and I think that going forward, the event helped generate buzz for our games and the Celtic Cardboard brand. Next year, we’ll definitely be back. And this time with more designers, more games, and most importantly, more space so the public can actually sit and play our games! Fickle Games were also at UKGE. I won’t recap what Robin’s said but I will reiterate a huge thank you to John and Ethan for driving the games over, I don’t think we would have been able to go without the help! Rampunctious was on sale during the event and we had Bragging Rights to show. We managed to get them both out for the press day and there was some interest in both. Unfortunately I didn’t get a chance to show off Bragging Rights much. Our stand was a bit crowded for all of us (bigger one next year for certain!) and there was no space to demo. That added with the sheer exhaustion after the day meant no open gaming space for us. I was a little disappointed to not be able to show it off and get some interest going but I guess that just means more promo of it elsewhere coming up to the launch. As well as selling games and showing them off I got to meet some really great people. Some of them were podcast-extraordinaires like Ben, some were other exhibitors like Partick and Gil from Formal Ferret, or even our fellow countrymen Rory O’Connor and Duncan Molloy who I’d never got to meet in person before. A great highlight for me was chatting to Michael Fox from the Creativity Hub, I had contacted them last year for some advice on making games and he was kind and awesome enough to spend a good hour and a half talking me through the ins and outs of publishing and distribution and I can’t overstate how helpful it was and how great it was to get some professional advice. This was all in the days before Celtic Cardboard where information on making tabletop games in Ireland was scarce. UKGE was really a great experience and I think a lot of that was having a good group of friends to help out and hang out with during it. I’ve done cons and expos on my own before and it’s exhausting. This was exhausting too but it was interspersed with lunch breaks and pizza parties so that’s definitely a plus. I’m pretty sure we’ll be there next year with some new games, a bigger space and hopefully more Celtic Cardboarders. Turtle Dream Games’ UKGE experience started off in about the most stressful way possible. UKGE started mid-fulfilment of our latest game, Dare to Dream, and our fulfilment company failed to deliver the copies for us to take to the Expo to our offices on time. Twice. After an exceedingly stressful 24 hours, we managed to arrange for them to overnight them to our hotel in Coventry for a Friday morning delivery, just in time to have copies for sale at the convention. As we did booth set up Thursday afternoon before the press event, things were pretty tense on team Turtle Dreams as there was a big empty space where our stock would hopefully be in the morning. Fortunately, we did have all of our demo copies and posters and banners and whatnot, and had a great time at the press event Thursday night talking to the various podcasters, bloggers, reviewers, and retailers who came through and showed interest in Dare to Dream. Between the positive response of the press and the camaraderie of our fellow exhibitors and Celtic Cardboarders, spirits were rising by the end of the night Thursday. Friday morning rolled around and with it our stock arrived! We managed to get it in just before the main gates opened for the Expo. That big stressor out of the way, we settled into a solid rhythm of talking about Celtic Cardboard, Dare to Dream, and the other games at the booth that held through the weekend. Being a two man team, myself and Sean traded off talking duties every hour or so and so each had a decent amount of time to explore the convention over the weekend. Even taking it in shifts though, I could feel the strain in my voice until the Wednesday following the Expo! One thing we were not sure about, and that was a big lesson learned, was what to expect from sales at a big event like this. I spent a lot of time last year promoting our previous game, Exquisite Beast, around the smaller con scene in Ireland. Most of these are events with an attendance of between about 200 and 500 people, so UKGE is about 100x the scale of those events (~39,000 turnstile attendance for the whole event). I wasn’t naive enough to think that would mean 100x the sales, but we really had no idea going in what it would be considering there is also a lot more competition at UKGE. The final tally for us was about 2.5-3x better for sales on a day by day basis than a smaller con, and I feel we had a great booth placement in terms of foot traffic; you could see other small indy booths that were more tucked away were not having as good of a time. In terms of direct benefit, we made a bit of a profit, which is nice, but I don’t even want to calculate what the hourly rate was split between the two of us. I feel we gained a lot of non-financial benefit from UK Games Expo though. We got to meet several of our backers over the weekend, and even though we thanked them several times each I felt even by the end of the convention I still hadn’t found a way to express just how important they really are to us. I’m also still working my way through the stack of business cards we collected, following up not only with reviewers and retailers about Dare to Dream, but also with reps from logistics and manufacturing companies about making our future games even better. As the others have mentioned, we also met a bunch of great fellow creators, which is both creatively inspiring and also makes us look forward to future UK events as an excuse to meet up with and hang out with new friends again. Deepest thanks as well to John and Paddy for manning the booth, working the crowds, driving the cars, and otherwise just helping us make the whole thing happen despite having no games of their own to sell at UKGE this year. Looking forward to going back in 2019! Thanks for reading. Do you have any questions about attending UKGE as a trader, or about UKGE in general? Or about conventions in general? If you do, let us know in the comments below.